Decorating the bathroom is fun, wouldn’t you agree? You have the chance to choose colorful mats and towels, cool artwork, and more. It’s a small room and can usually be decorated on a small budget and quickly, as compared to the living room for example. But what about your bathroom windows? Do you have shades, blinds, or curtains over them for privacy? 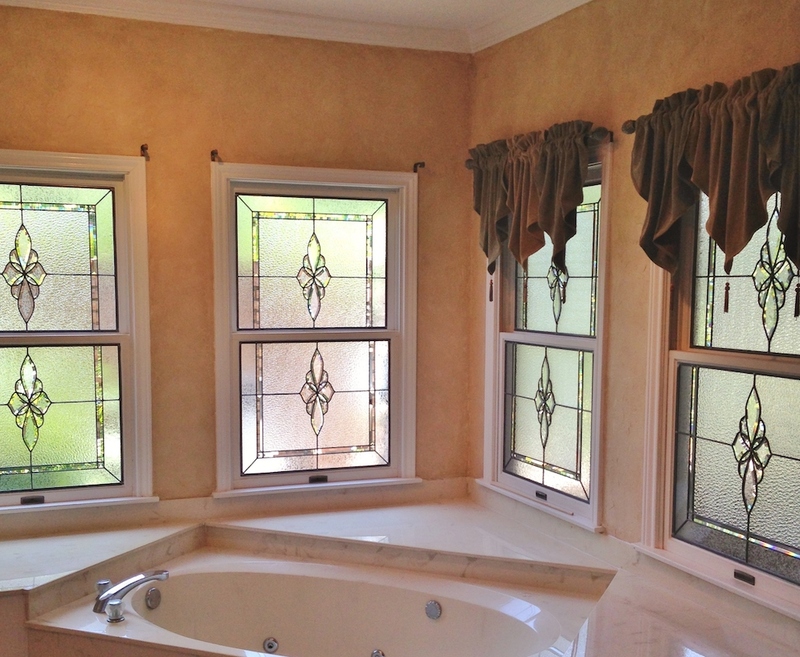 Have you considered bathroom stained glass or custom stained glass? Bathroom stained glass adds privacy along with beauty and an elegant, sophisticated touch that will elevate your bathroom’s décor instantly. 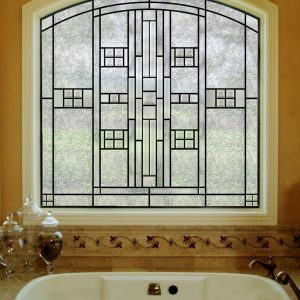 If you’ve been looking for something special in your bathroom, stained glass windows or doors might be just the thing. 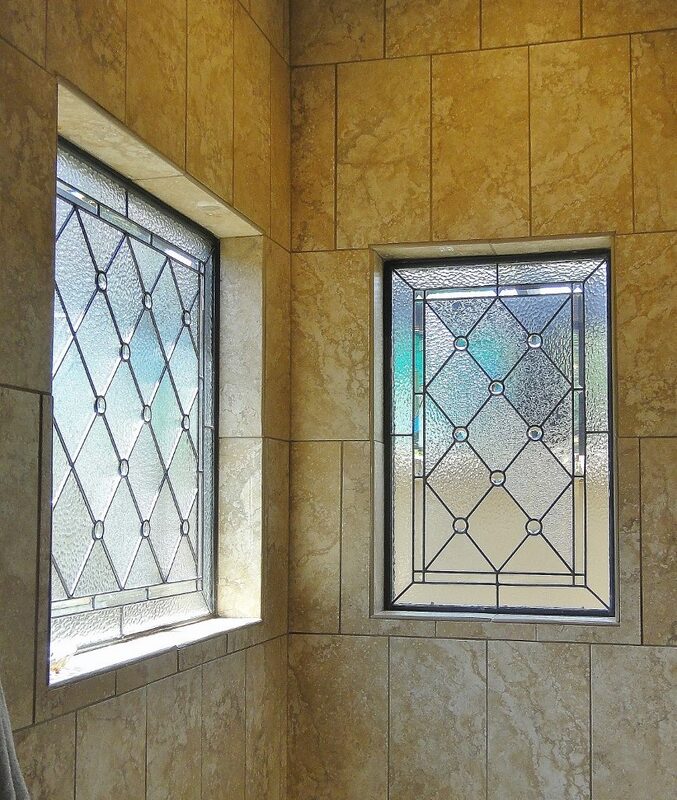 When we do stained glass for a bathroom, our clients tell us what kinds of styles and designs they like. 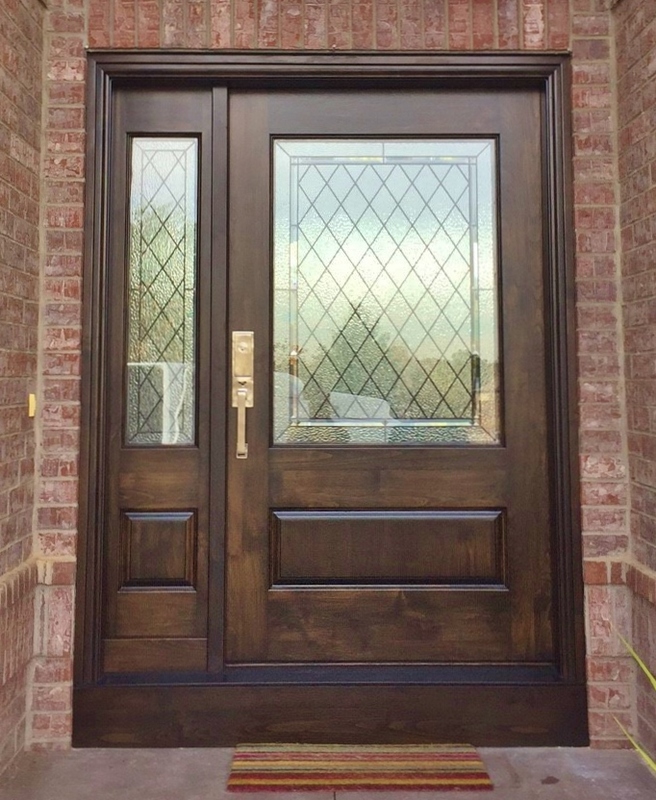 They will frequently choose leaded and beveled stained glass. This is a colorless style, using mostly frosted glass mixed with the beautiful beveled glass that catches the light in such interesting ways. In this way, clients have the beauty and specialness they are looking for along with the privacy they need, and the natural light can still shine through into the bathroom. 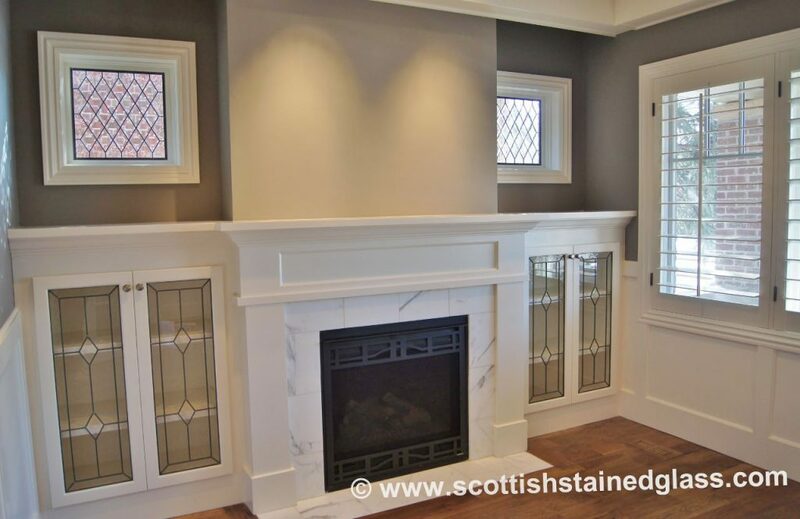 Our bathroom stained glass is custom designed to each client’s specifications. Our clients tell us that working with one of our designers to choose their style and design is the most fun part of the process, second only to enjoying their brand new bathroom windows once they are installed, of course! 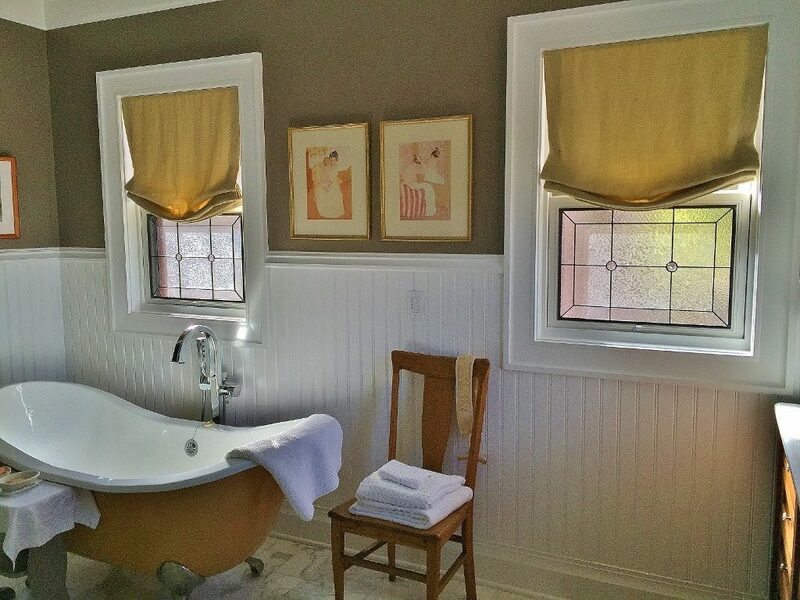 Click here to peruse our bathroom photo gallery and click on any thumbnail for an enlargement showing the gorgeous detailed workmanship involved in the construction of these windows. 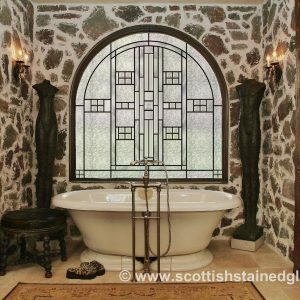 To make an initial design consultation for your own custom designed and hand crafted bathroom stained glass, please give us a call today or use our handy online form. Next Post Should I Have Stained Glass Covering Installed?